Marble flooring is a stunning addition to your home or business when it is first installed, and can have great longevity if it is cared for and maintained correctly. As it is a naturally occurring stone it can keep its regal and beautiful appearance even under heavy foot traffic. It is one of the softer stones available it can be prone to marking or scratching if not cleaned and looked after as it should be. Marble is particularly reactive to acids, and as many foods such as fruit, tea, and carbonated beverages have a low pH rating making spillages hazardous to your flooring. If left untreated acidic substances can leave dark marks or etch grooves into the surface of the stone dulling the appearance of the floor. It may be best to avoid using marble therefore in rooms where there is a high risk of contamination, such as in a kitchen. Should a something be spilt it is important to act fast to avoid lasting damage. Simply wiping the floor clean will not remove all the acid that remains and will continue to eat away at the stone even if it looks spotless. The best way to remove all traces is to use a cloth dipped in a solution of hydrogen peroxide mixed with a few drops of ammonia. Rub the surface of the marble with this cloth until it shines again. Aside from food and drink spillages, there are other sources of acid that could cause erosion of the stone. These come in the form of cleaning fluids that are not appropriate for the cleaning of marble. Vinegar solutions and many off-the-shelf detergents are acidic and therefore not suitable for use on delicate stone such as marble. These cleaning products will cause more harm than good and continued use can forever dull the appearance of the floor. It is best to use pH neutral and natural gentle products to keep your floor looking shiny and as new, these are widely available from specialist shops and in some supermarkets. General maintenance of marble only requires using a soft towelling cloth to wipe any dirt away and to regularly dust at the edges and corners of the room. If water is required to shift stubborn dirt this should be lukewarm as opposed to hot and scrubbing should be avoided unless hard dirt has set onto the marble. If left, dirt can cause lasting marks as most marble is light in colour and therefore susceptible to dark marks which are easily avoidable. Polishing, whilst not mandatory, can give a shining, glittering finish that makes even more of a feature piece of your flooring. 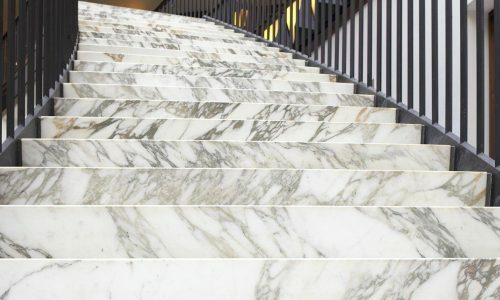 High shine is a great way to make marble look regal and elegant and is therefore used often in grand entrance halls and on staircases. As marble flooring is an investment and a statement addition to a room, polishing ensures that it is shown off at its very best.